This rule applies to flightcrew members operating under part 91 only if at least one their flight segments is operated under part 117. Flightcrew members operating under part 91 and who do not have any flight segments subject to part 117 (e.g. pilots flying only part 91 operations) are not subject to the provisions of this rule. This rule allows all-cargo operations to voluntarily determine, as part of their collective bargaining and business decisions, whether they wish to operate under part 117. In order to prevent manipulation of this voluntary provision, certificate holders who wish to operate their all cargo operations under part 117 cannot pick and choose specific flights to operate under this rule. (2) all of their all-cargo operations not conducted under contract to a U.S. Government agency. Q65) If a Flightcrew member is assigned a part 91 ferry flight, are the Flight Time Limitations, FDP Limitations and Rest Requirements exemptions still permitted as under the OLD part 121 regulations? A65) No, 117.1 requires that part 117 applies to a flight operation under part 91, other than subpart K, on behalf of the part 121 certificate holder if any flight segment is conducted under part 121 subparts Q, R or S (passenger operation). 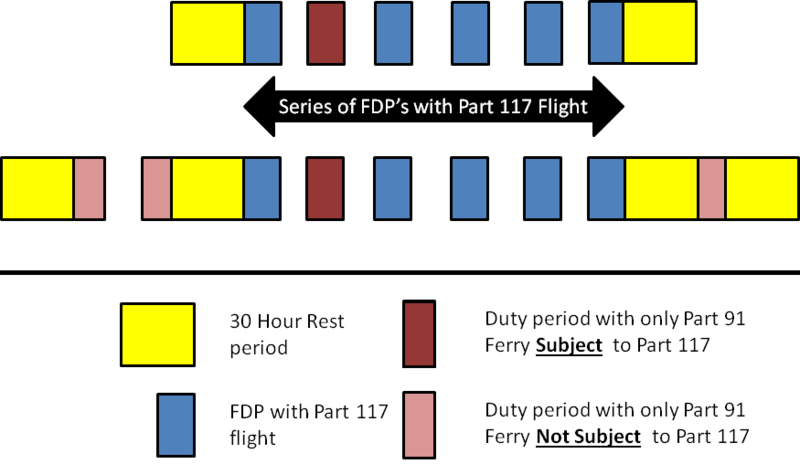 The key to understand this provision is to understand that a part 91 ferry flight will be considered equivalent to a part 117 flight if such a flight is within the same series of FDPs. The FAA has defined a series of FDPs as: A series of FDPs consists of FDPs that take place between the 30 hours of rest specified in 117.25(b).